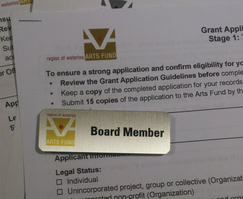 The Arts Fund is managed by a 14 person board of volunteers, representing a broad spectrum of involvement in the arts. It serves the three cities (Cambridge, Kitchener and Waterloo) and the four townships (Wilmot, Woolwich, North Dumfries and Wellesley) that make up Waterloo Region. The mission of the Region of Waterloo Arts Fund (Arts Fund) is to contribute to the vibrancy of the arts and cultural sector in Waterloo Region. It does this by promoting, encouraging, and providing support to arts organizations and individual artists. The Region of Waterloo Arts Fund Directors are elected to the board and are responsible for allocating the funds provided by Regional Council on an annual basis. Applications are assessed using the peer review model - the people with the best expertise to review project proposals and discern which artistic projects are of highest quality and worthy of support are artists and individuals with extensive involvement in the arts. The Arts Fund has had a significant impact on the development of the creative arts community throughout Waterloo Region. the arts community. Serving on the Board is both an opportunity and a commitment. To view our full page of scheduled meetings click here. Adopted by Resolution of the Board of Directors of the Region of Waterloo Arts Fund on June 5, 2008; amended by Resolution on April 12, 2012.